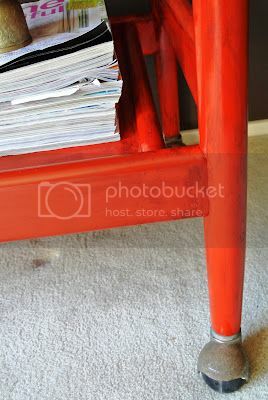 I just love this as a piece of furniture – it can do anything! 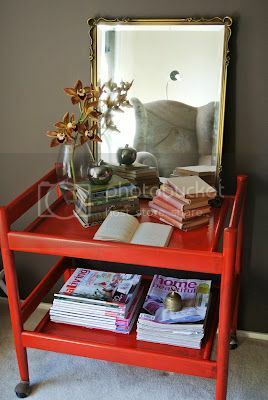 Prop up a vintage mirror, some of my nannas old books and a stack of magazines and it looks gorgeous and is great for storage. A perfect pop of colour in the lounge room; a great hall table; or I can even imagine it stacked with towels, bubbles and soap in a bathroom! With this piece I spray painted it fire engine red, the rubbed it over wth black acrylic. I’ve kept the original wheels, they work perfectly and I love the patina developing on top. With any luck this piece will be grabbing the attention of passers by at my first market stall in September. I should hear next week if I’ve been accepted, keep your fingers crossed for me!! 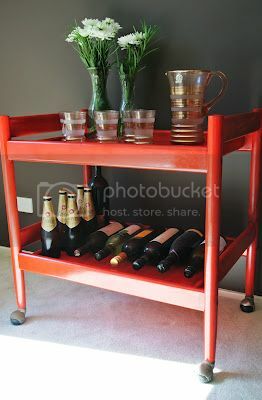 The post Drinks Trolley / Storage Cart appeared first on Paisley Vintage.